I had just posted a picture, a few hours ago, of a very pregnant Victoria Beckham who was well into her 9 long pregnancy months, wearing a pair of very high heels. I guess I was lucky I posted that at the time I did, because now we get the news that Vic\Posh has already delivered a beautiful baby girl. Victoria & David Beckham already have three previous sons, since they got married in 1999. No name has been chosen yet for the new baby girl. As a side note, it turns out that Victoria Beckham & Kate Hudson delivered their babies in the same hospital. I wonder if they babies will grow up to be play mates. IMO, I think they totally would. Her laugh is so….Madri, funny? cute? silly?…. It doesn’t really matter. Just listen to that whole thing. It’s amazing. Artist of the Year? Best Dance Playlist Ever! Pitbull seems to be the Sugar & Spice needed to transform up any bland song around these days. Wow. Like super Double Wow. There isn’t a name in the music industry that hasn’t collaborated with Pitbull. From Usher to J.Lo to Enrique. Let me give you some huge examples. Pitbull is featured on some of the most amazing, popular, and successful songs of 2010/2011. If you ever need to make a dance mix, all you have to do is put these following songs on your playlist; and you’ll have a great night of jamming. I guarantee you’ll sweat a bucket and have a ball, all at the same time. Pitbull with Usher? “DJ Got Us Fallin’ In Love”. Pitbull with J.Lo? “On the Floor”. Pitbull with Enrique? “I Like It”. Pitbull with T-Pain? “Hey Baby”. Pitbull in the Number One 2011 Hit, with Ne-Yo? “Give Me Everything, Tonight”. Pitbull with BuNabeel & BuQutada? Akeed, bedoon kalam. And of course the original, “Me No Speak No Americano (the Bon Bon)” song? Please, just get all these songs onto one playlist, and jam till there’s no tomorrow. You have got to do it. I wish I had someone who would recommend playlists for me, bedoon ma3awwer rasi. So, yala go ahead and make a new upbeat\dance mix. Are You Going to Glastonbury Fest. This Year? 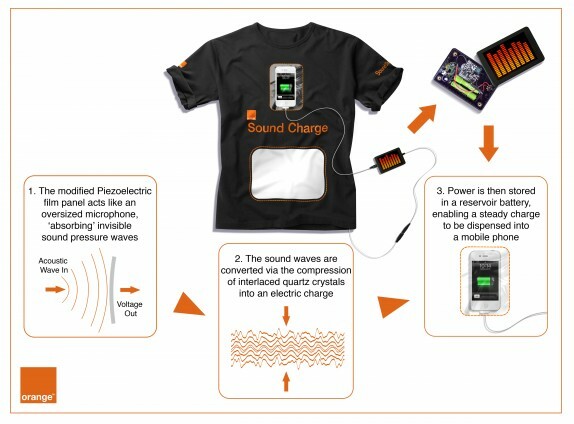 Then you’ll be happy to know that you can recharge your mobile phones just by listening to the musical sound waves, with Orange’s special “Sound Charge” t-shirt. What a great way to use all that musical power. U2, Coldplay, Beyonce, and Paul Simon are all part of this year’s lineup at the Glastonbury Fest. I envy anyone and everyone going there this year. You better get me a t-Shirt. 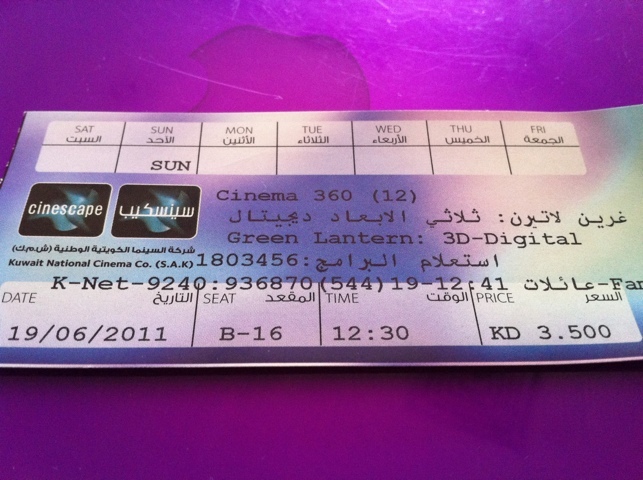 We went to see the Green Lantern today, and we were a bit hesitant because a lot of people didn’t like it. For me, the movie was good, it was fun to watch, wasn’t too stressful or bloody, beautiful actors, and in the end Good beats Evil. What more would you want. If you were thinking of going, then just go and don’t listen to the negative remarks. It’s a good movie, not as good as Thor or as engaging as Pirates; but is still a good movie and fun to watch. The Green Lantern is the #1 box office hit in the States right now, which means that it’s popular. Check the movie’s trailer here. Both games are free, and you can find them in the App store. The Scrabble game (shown above) is much harder than the other game, because for you to win a game, you have to use up ALL of your letter chips; which is pretty hard to do. I’ve won a maximum of 4 games so far, and that is after spending a couple of hours, minimum, per game. This is the easiest of the two games, and it’s called Scrabble Blast. It’s super fun to play, easy enough to score high, and ends when there are no more word to form. You don’t actually have to use all of your letters in order to finish the game. Both games are free and fun to play. 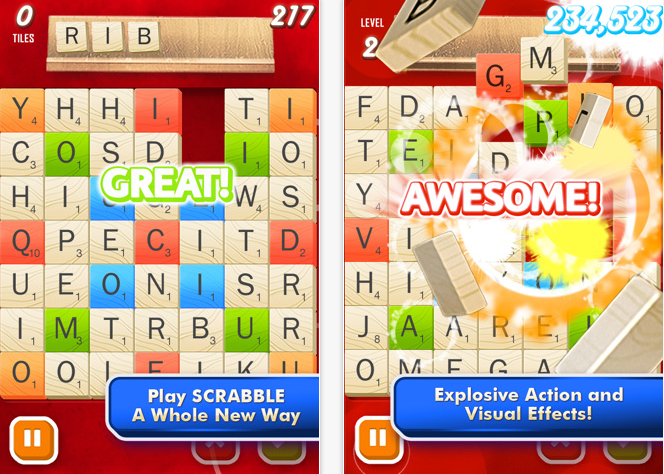 But if you’re looking for a short easy game, then chose the Scrabble Blast. 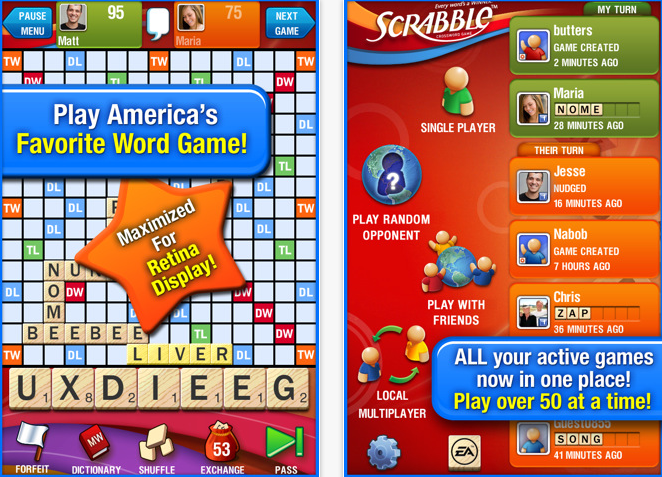 And if you’re looking for a mind-stimulating game, then go for the full Scrabble version. The Scrabble one will take you atleast a couple of hours, and the possibility of hair lose, but will also satisfy you the most if you ever finish it. You can find the games in Apple’s App store (here & here). Hot in Cleaveland: Not a new show, it came out last year. Good Show. Happily Divorced: Only saw the pilot episode, but seems funny enough. Breaking In: This is a good show, saw three episodes so far, and don’t mind watching more. Love Bites: Can’t say I like this show, cause I only parts of it (like the NYC part, but not the SF part). But check it out, you might like it. Just keep in mind, I didn’t like it that much.